It began with a novel ten years ago. Let The Right One In by John Ajvide Lindqvist. Obviously a Jim Morrisey fan. The novel became a bestseller, was marketed abroad under the English title Let Me In. Set in the Swedish suburb of Blackeberg, it tells of a very unusual friendship between two extremely lonely children. One of them proves to be a vampire. A successful Swedish motion picture followed. Then an English language film. In Sweden a stage play was mounted in Uppsala. Then an English language stage play mounted first in Scotland, then at the Apollo Theatre in London. Now that same show will transport to St. Ann’s Warehouse in Brooklyn for a January-February run in 2015. St. Ann’s makes for a huge space, ideally suited for a show that pretty much uses a winter forest as the location, even as scenes shift around to locations all over Blackeberg (like a school, a playground, different apartments, etc.) . John Tiffany will direct with Steven Hoggett associate director. 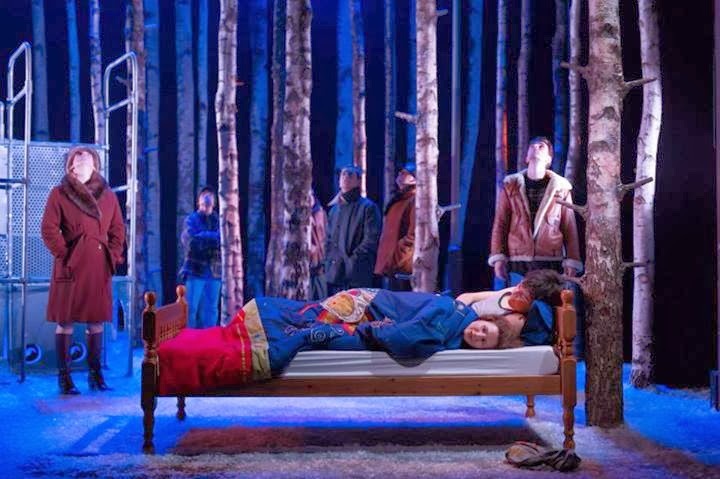 The National Theater of Scotland acts as backer of this new run, along with commercial producers Bill Kenwright and Marla Rubin, who were involved in the show from the very beginning. Essentially the plot deals with Oscar, a seriously bullied child with a single Mom who doesn’t really much understand her morbid, sad, angry son. He has cause for rage. Like too many children all over the world and throughout time, he is an object of casual torture by his peers. In the book, he’s a very chubby boy. None of the adaptations have included that detail, instead focusing on his being an outsider in other ways. Either way, Oscar is a target, the natural prey of a particular trio of bullies. And as is typical, he does not share his torment. Oscar’s mother does not know, nor his teachers. One night, a mysterious pair move into the apartment next door to Oscar. In some ways a mirror of Oscar’s household, they consist of an older man and a little girl about Oscar’s age, presumably his daughter. Eventually the two children meet and we (along with Oscar) learn her name is Eli. Due to what some call the “magic of theatre” all the children in the play are portrayed by adults, the kind of stylization theatre-goers accept without question soon after the play begins. It also makes casting the parts many times easier, since Oscar and Eli remain very complex characters who have to go through a great deal of powerful changes in the course of the show–a roller coaster of horror, love, hope, despair, danger and guilt and loyalty. As noted earlier, Eli is a vampire. She looks twelve and in many ways remains that age (Note: Human brains do not fully mature until about age twenty, so she would remain to some extent permanently a child, not just physically). The man who takes care of her is not her father, not at all. Rather he is a caretaker who for reasons of his own–profoundly disturbing, selfish, yet also sad–hunts victims for their blood to feed Eli. Unfortunately (an interesting adjective under the circumstances) he really isn’t that good at it. More, unlike many versions of the undead in recent years, the vampirism of Let The Right One In remains utterly horrific. One bite infects, so Eli must kill her prey. There’s a strong hint that if she does not feed, she begins to rot. She remains simultaneously an innocent child, a victim of horrific abuse, and a predatory monster. Much of the play focuses upon Oscar learning this about his new (perhaps first, certainly sole) friend. He comes to terms with it. Accepts it. Which manages to feel both heart-warming and utterly inhumanly terrible in the same instant. Lindqvist is on record as calling his novel a love story, and in keeping with that the play even incorporates a few elements from a kind of sequel (he called it an “epilogue”) title Let The Old Dreams Die. Looks interesting. I may look into going, that’s not too far from me.